Axiom Pro is engineered for captains that want it all. Available with RealVision 3D, 1kW CHIRP sonar, and Raymarine HybridTouch control, Axiom Pro is the new standard for �all-in-one� display. And with a blazing fast quad core processor, a super bright IPS display, and the smart LightHouse OS, Axiom Pro delivers a fluid and intuitive navigation experience. Axiom Pro is easy to expand into an advanced navigation network that includes multiple Axiom displays, CHIRP radar, Evolution autopilot, FLIR thermal night vision technology, and more. Rewind, pause and playback recorded sonar history to take a closer look fish and structure, and easily plot waypoints. RealVision 3D combines with precision GPS to construct the most accurate 3D model of the underwater world, in real-time. Simply add a compatible offshore transducer and experience the stunning definition and clarity of dual-channel CHIRP sonar. 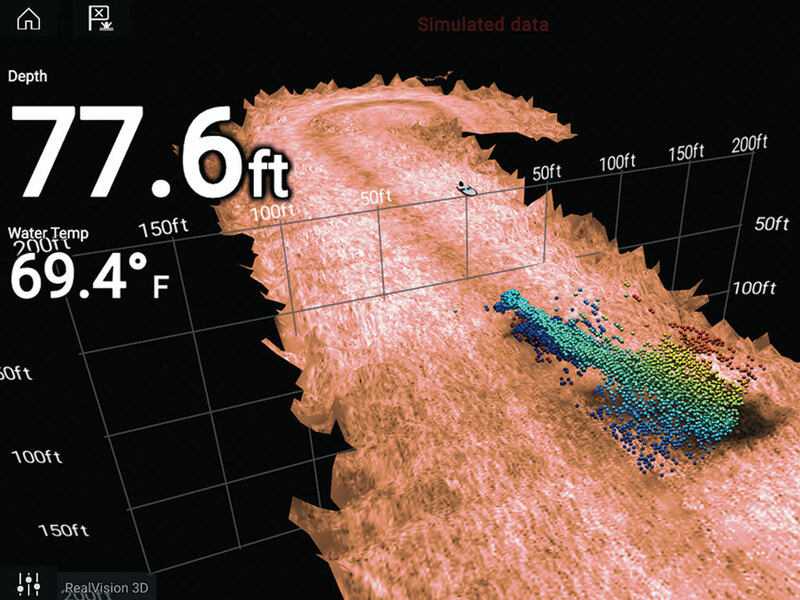 Adjustments to sonar gain, sensitivity and filtering are also applied to recorded sonar history, enabling you to reveal previously concealed fish and structure. No gimmicks or games, this a true 1kW sonar � No compromises performance targets bait, fish, thermoclines and more at depths to 5,000 feet. Axiom Pro 1kW sonar offers a wide spectrum of CHIRP sonar bands for deep, mid-range and shallow water fishing. 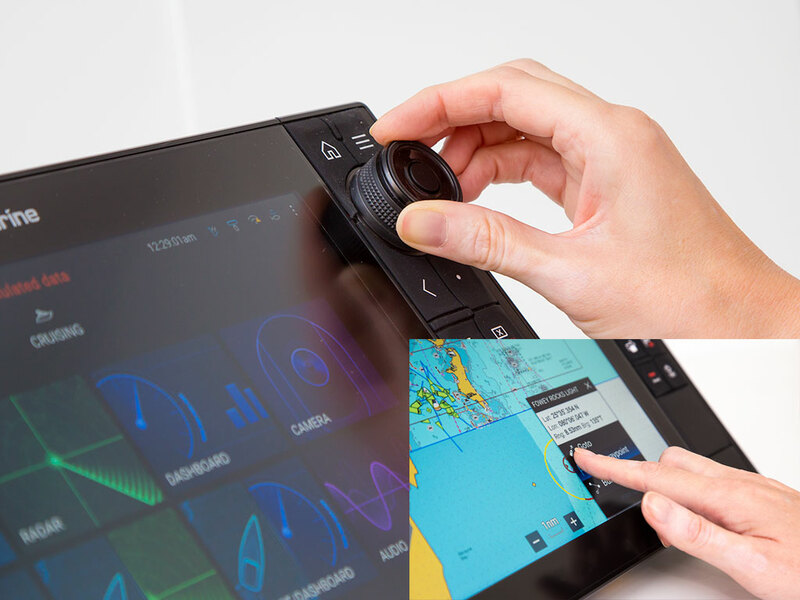 Your choice of simple tablet like touch screen interaction or confident keypad control in rough seas. Get instant access to your favorite function with Axiom Pro�s user-programmable Custom Key. Add the optional wired RMK-10 keypad to control Axiom Pro from anywhere. RMK-10 can control a single or multiple MFDs at the same location. Axiom Pro�s quad core processor delivers instantaneous response and the ability to run multiple apps simultaneously without any slowdowns. 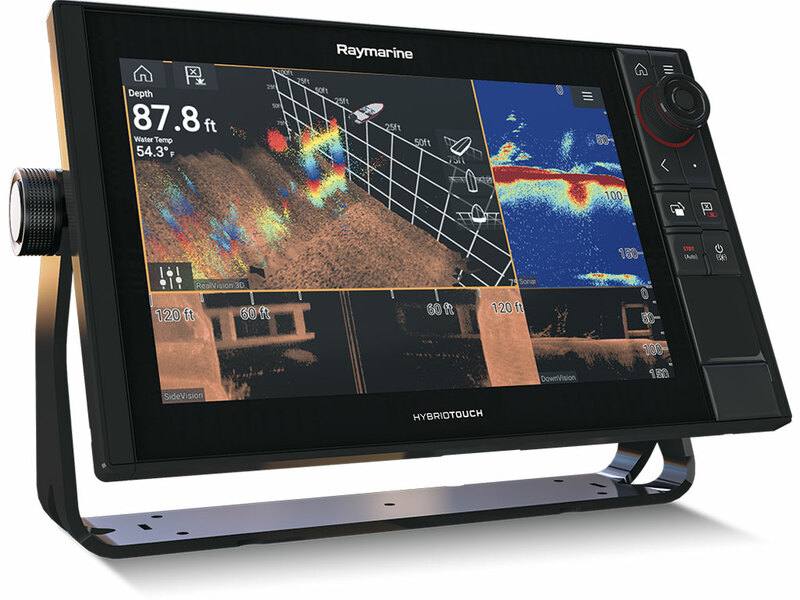 Raymarine optical bonding technology and IPS display panels give you stunning color, clarity and contrast in all lighting conditions. Plus, Axiom Pro looks great even through polarized sunglasses. Combine Axiom Pro with the FLIR M132 or M232 thermal camera and enjoy Clear Cruise IR Analytics. Axiom Pro will alert you automatically to hazards in the vessel�s path. Axiom Pro is compatible with the Raymarine CP470 and CP570 Professional CHIRP sonars. Enjoy powerful sonar output up to 2 kilowatts and dual, independent transceivers on CP570. Keep an eye on everything onboard from the helm. Axiom Pro supports both video over IP and analog cameras and entertainment sources. Axiom Pro works with Raymarine's full lineup of Quantum CHIRP, HD Color and Super HD Color radar scanners. Enjoy all weather, day or night navigation, collision avoidance and bird finding tools. Axiom comes with a built-in 72 channel GPS/GLONASS receiver with fast update. Use the optional GA150 antenna accessory to boost GPS reception onboard vessels with enclosed pilothouses or metal construction where the MFD does not have a clear view of the sky. Rock the boat! Integrate Axiom Pro with multi-source, multi-zone marine audio from Rockford Fosgate. Change sources, select tracks, control zones, and much more right from your MFD. Axiom Pro is engineered for captains that want it all. Available with RealVision 3D, 1kW CHIRP sonar, and Raymarine HybridTouch control, Axiom Pro is the new standard for �allin-one� multifunction devices. And with a blazing fast quad core processor, a super bright high-defi nition IPS display, and the smart LightHouse OS, Axiom Pro delivers a fl uid and intuitive navigation experience. Axiom Pro is easy to expand into an advanced navigation network that includes multiple Raymarine Axiom displays, CHIRP radar, Evolution autopilot, FLIR thermal night vision technology, and more. *Pro S can only be used with CPT-S transducers that also connect directly to CP470 sonar module. Requires A80490 adaptor cable.